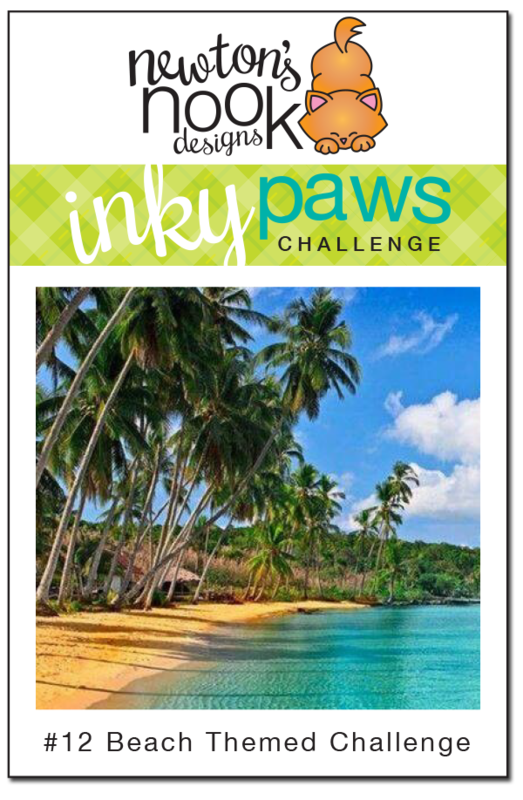 Happy Friday and the the first day of #12 Inky Paws Challenge! This month's challenge is a Beach - Theme Challenge! You have two weeks to play along. Deadline to enter is Friday, August 8th, 2014 at Midnight CST. The winners will be announced on the NND blog on Monday, August 11th. Create a NEW project (card or other paper craft item) based on the beach theme. Post your project to your blog or to an online photo gallery such as Flickr , Pinterest, or splitcoaststampers (on splitcoast please use keywords newtonsnook and IPC12). Don't you just love this fun bright yellow card by Lydia? It reminds me of sunshine! 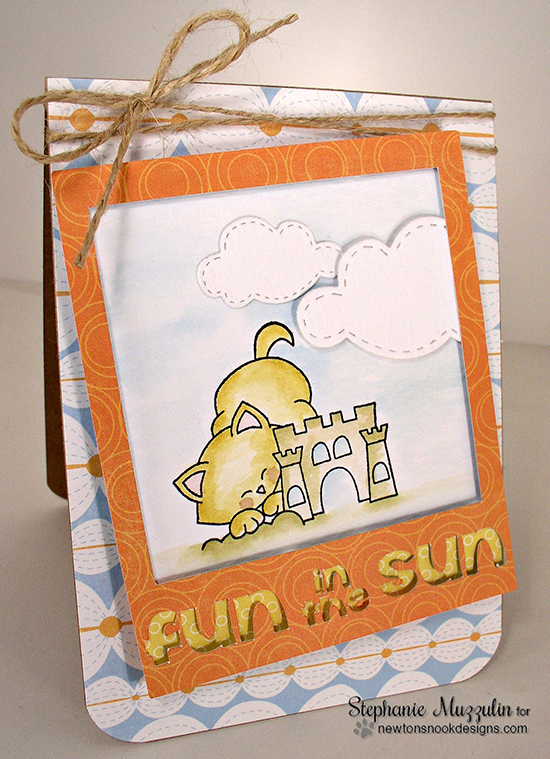 I love how she colored the kitty and sandcastle image from our Newton's Summer Vacation set! Adorable! Here's a great beach card by Stephanie! I love her color combo and cut clouds! And its cute how she gave the kitty from our Newton's Summer Vacation set rosy cheeks! Makes me smile! Here's a great sweet little beach treat by Tessa! 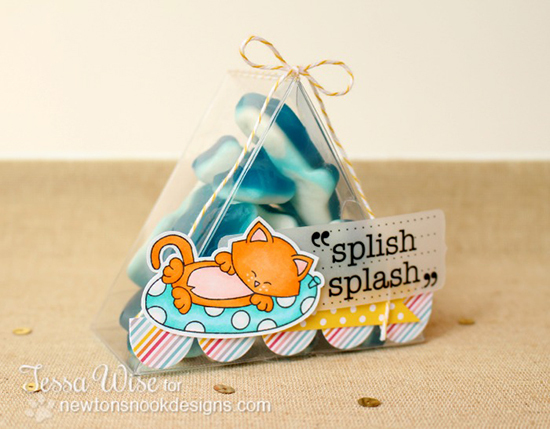 She colored the cute kitty from our Newton's Summer Vacation set and added him to this cute little container of gummy sharks! YUM! 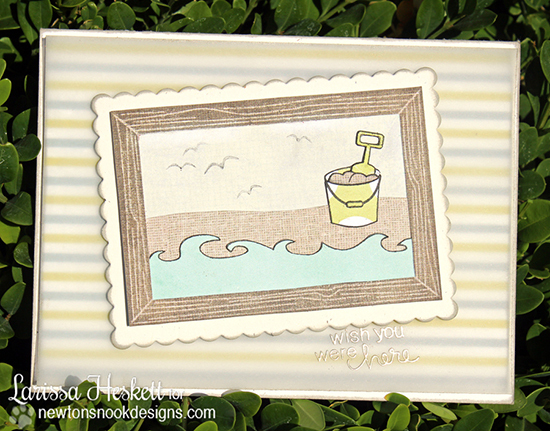 Larissa created a fun "framed" beach scene using the frame from the Around the House set, the water from the Beach Party set and the Pail of sand from Newton's Summer Vacation. Love this idea! 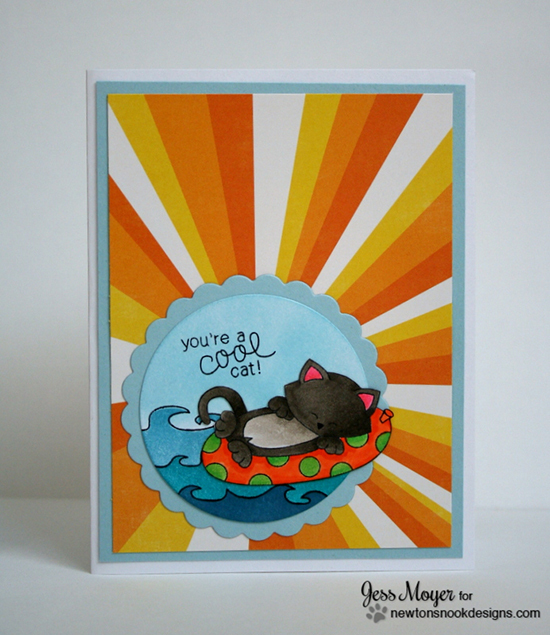 More Sunshine from Jess - this time in the form of rays - Super Fun! She used our Kitty on in inner tube from Newton's Summer Vacation and the waves from the Beach Party set. 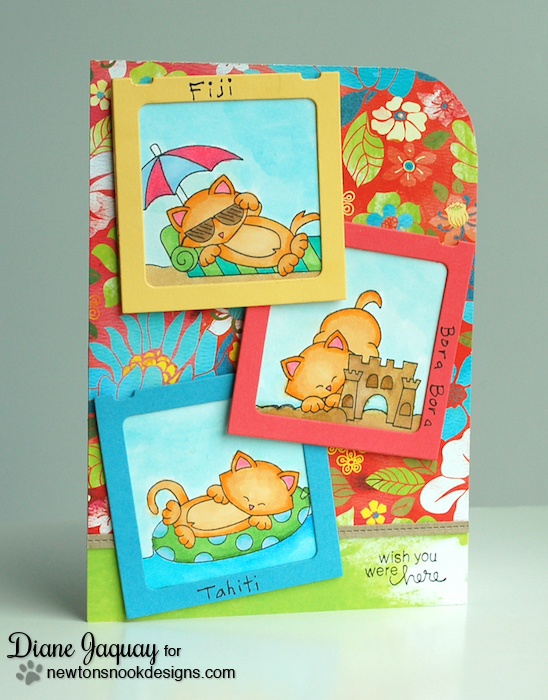 Danielle created this pretty watercolor beach scene with the kitty on the innertube as the focus! Love how bright those watercolors are! She used stamps from Newton's Summer Vacation. 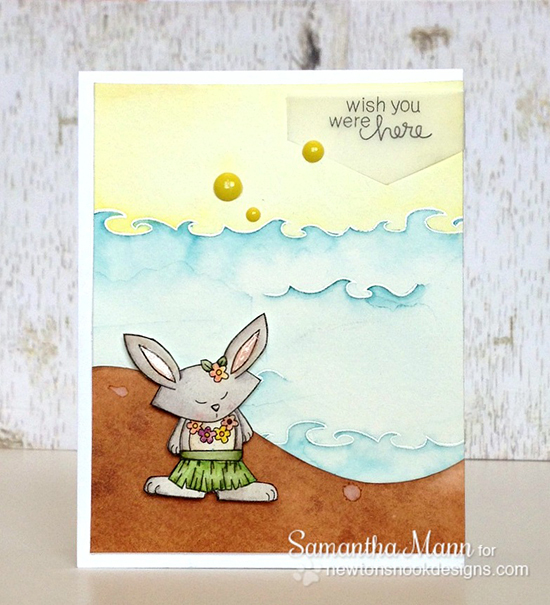 Samantha used the super cute hula bunny from our Beach Party set and the Wish you were here sentiment from Newton's Summer Vacation. I love how she colored those waves! 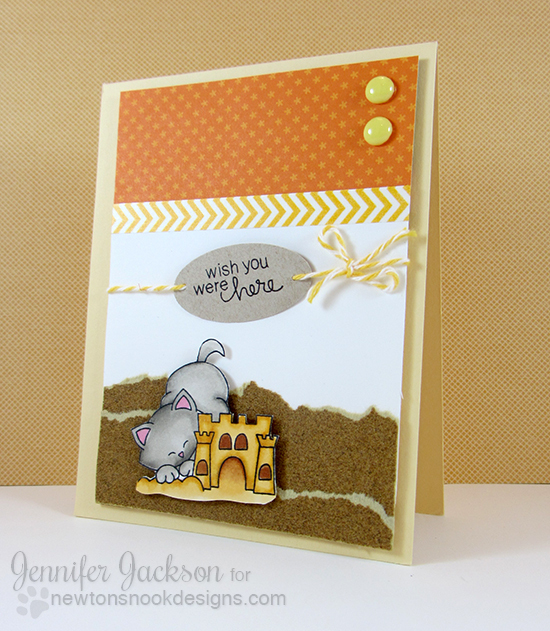 Here's one from me (Jen) - I also used the kitty from from the Newton's Summer Vacation set and I used sandpaper to create the beach along the bottom- Doesn't it look fun?